Paris : France retaliated with heavy bombing in Syria as an aftermath of serial blasts in France past weekend, which rendered dozens injured and caused huge fatalities. French fighter jets, more than a dozen on their count, bombed a series of ISIS sites in Raqqa, Syria, on Sunday in what officials described as a major bombardment.The airstrikes came two days after a series of terrorist attacks in Paris. ISIS had claimed responsibility for the attacks, propelling the French leadership to take immediate retaliation. the attacks received worldwide condemnation and world leaders who had come together for the G 20 summit in Turkey, condemned the attacks with severity, terming it an assault on humanity and civilized world. Turkey too witnessed a similar one-off situation in the vicinity of G 20 avenue, promoting intense criticism from world leaders, and making them stand united against terror, with a stronger determination and commitment. France’s President Hollande had earlier described the serial attacks as an ‘an act of war’ and had made very clear, France’s intentions of not taking it on their chin and retaliating with a much stronger bombing rebuttal. 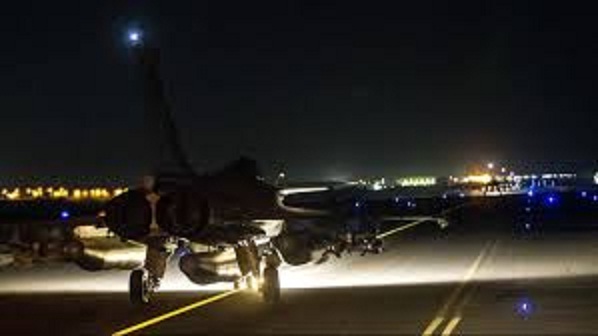 The last night air strikes from French fighter jets confirmed the France government’s will and converted the words into bombarding action-oriented retaliation. Raqqa found the bombs arriving as ISIS has claimed Raqqa as the capital of its so-called caliphate. The targets in Sunday’s airstrikes included a command center, a recruitment center, an ammunition storage base and a training camp for the terror group, as confirmed by Mickael Soria, press adviser for France’s defense minister. Twelve aircraft, including 10 fighter jets, were involved in the airstrikes, from which, twenty bombs were dropped, which fell bang on the targets and resulted in destroying of all of the targets. However, an ISIS media wing claimed that the sites had been abandoned prior to the attack and said there were no casualties. France had been conducting airstrikes against ISIS targets in Syria since September as part of a U.S.-led coalition.The recent retaliation attack had French jets involved in the French airstrikes, the jets took off from the United Arab Emirates and Jordan in a mission carried out in coordination with U.S. forces, the French defense ministry said in a statement late Sunday. The sites targeted inside Raqqa were identified in earlier French missions too. The airstrikes hit several key ISIS facilities, including the city’s stadium, which was used by ISIS as both its headquarters and a jail.